Every woman is blessed with a unique set of features that set her apart from the crowd. From a stunning heart-shaped face and mesmerising eyes to statement cheekbones, no two faces are the same. Then why should we all indulge in the same type of jewellery? 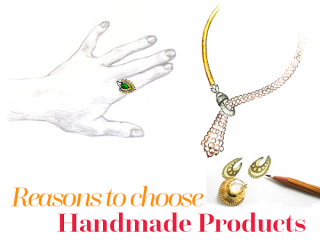 Choosing your jewellery as per your face shape accentuates your features and enhances your beauty. 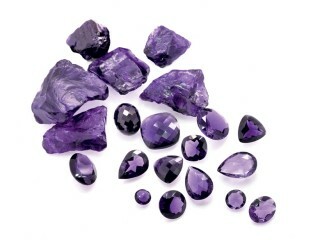 A diamond-shaped face complements jewellery in a different way compared to a heart-shaped face. 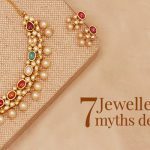 Find out which jewellery designs and styles are best for various face shapes to bring out the dazzling diva in you. While choosing earrings for round face shape, make sure you opt for dangling designs. 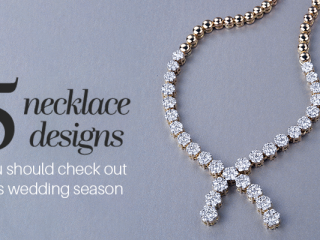 Elongate a round face with long ornaments that create an illusion of length. If you have a round face, look for long earrings that elongate your face. Earrings that float lower than your chin are ideal but don’t use wider chandeliers or round dangles, they’ll argue with your shape. Stick with a look that is narrow. 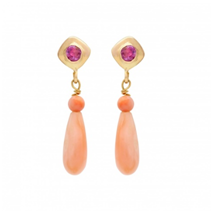 Try our Enchanting Coral and Ruby Drops for a dash of simplicity and elegance. These spectacular danglers feature both a beads and tear drops, set in 18k gold frames. 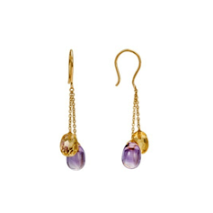 You can also opt for Flirty Golden Topaz and Amethyst Danglers to complement your cocktail dress of evening gown. The uneven lengths of the muted beads, encased in 18k gold make it the perfect accessory for your evening plans. 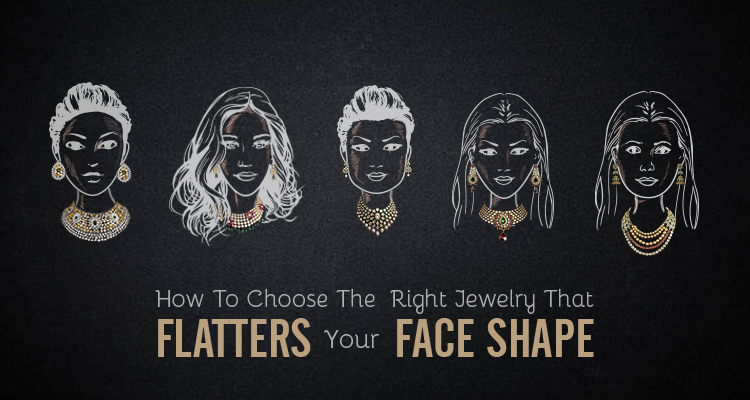 Women with oval faces should opt for the opposite of the jewellery recommended to round faced women. Earrings for oval face will balance your long face. Wide Chandeliers, as well as earrings that widen at the bottom, circles, curves and large studs, are the best earrings for oval face. Furthermore, oval and teardrop styles look fabulous on oval faces. Be a trendsetter and step out in our Spectacular Silver and Gold Studs. The eye-catching pattern shows off a magnificent emerald mounted at the centre with 18k gold stalks. The flawless sapphire drops scattered around the silver leaves will make you the showstopper of the evening. 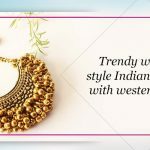 If you love contemporary designs, you can opt for Iconoclastic Gold Danglers. 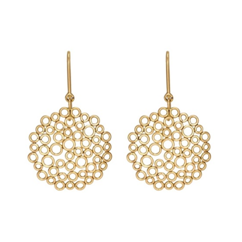 The honeycomb motifs handcrafted in fine 18k gold showcase asymmetrical circlets encompassed in a hive-like design. Furthermore, the clever use of negative spaces will perfectly complement your quintessential oval face and sharpen those stunning facial features. 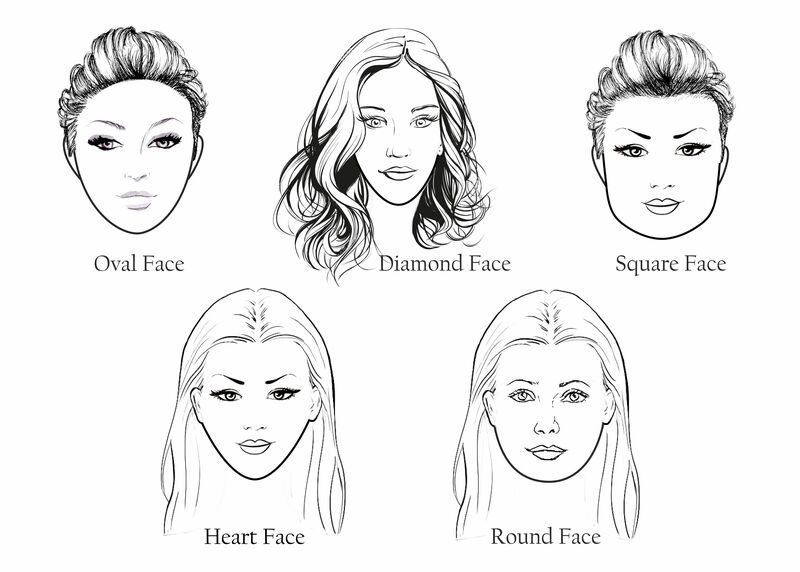 A rectangle face is an oval face with a strong, angular jawline. Accessorising a rectangular face is all about softening the bone structure with rounded ornaments. 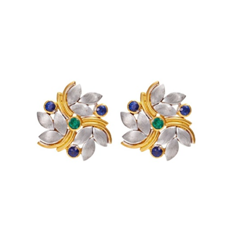 Women with rectangular faces should look for earrings that add some curves. Look for wide circles, teardrops and curves. Avoid shapes that are wide and have strong lines and corners. Keep on the lookout for hoops, elongated and dangling pieces. 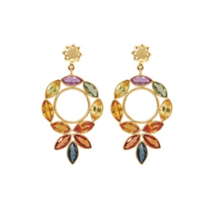 Opt for Iridescent Multi hued Danglers and colour your world with an impeccable marquise of multi hued sapphires. The gorgeous 18k circular gold frame and exquisite floral design make it a staple piece in your evening wardrobe. 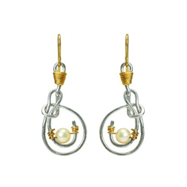 You can also opt for Beguiling Pearl, Gold and Silver Earrings handcrafted in sterling silver. The jewel is encased in 18k gold wires with a quirky sailor’s knot cradling a precious pearl. Accentuate your features with these danglers and keep the compliments coming! A heart-shaped face typically has a broad forehead with a sharp chin. To balance a heart-shaped face, look for earrings that have elongated curves. 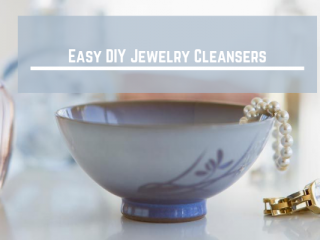 Styles such as dangles, chandeliers, and teardrops are your best bet. Accentuate your heart-shaped face with our Lightweight Gold and Ruby Drops. The minimalistic design, encased in 18k yellow gold, make it the perfect accessory for ethnic or modern attires. Additionally, the striking contrast offered by the muted gold frame and the vibrant rubies is guaranteed to keep all eyes on you. 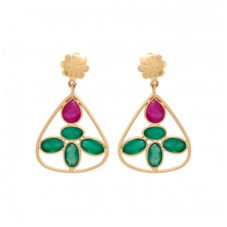 You can also opt for Emerald and Ruby Dainty Drops set in 18k yellow gold. The contemporary design makes this masterpiece an all-time classic. Women blessed with a diamond-shaped face are all about statement cheekbones. 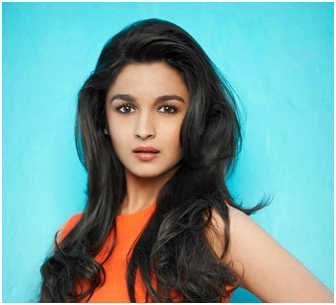 They often have a small forehead and a sharp chin with high cheekbones which accentuate their facial features. 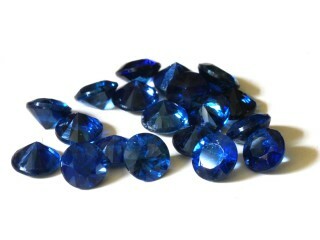 Additionally, diamond-shaped faces have a lot of adversity making most earring types compliment their faces. 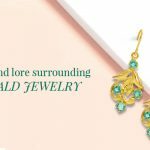 Look for earrings that have wide-bottom chandeliers, curves, elongated dangle, and teardrop styles. Bring out the tribal goddess in you with our Artistic Citrine and Emerald Bead Earrings in 18k Yellow Gold. 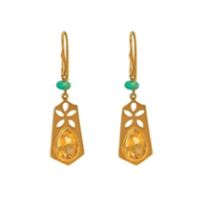 The thin sheets of 18k gold feature enchanting citrine teardrops with a cut work floral pattern. The contrasting emerald beads add a dash of freshness to this contemporary piece. 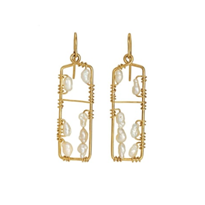 You can also opt for Quirky Rice Pearl Gold Danglers threaded with 18k gold wires. 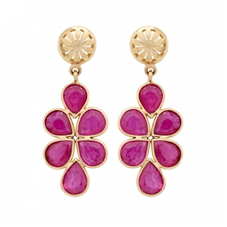 These funky earrings add a fun twist to a formal wardrobe. Apart from the perfect jewellery for the shape of your face, the ultimate accessory to bring out your best facial features is a dazzling smile. 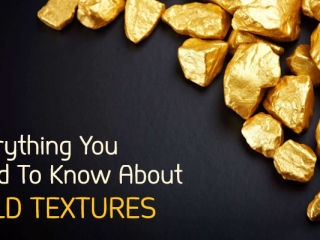 From heart-shaped face to a diamond-shaped face, there are a plethora of options to choose from. 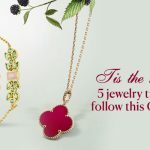 Check out our five necklace designs to get a closer insight into the plethora of jewellery styles and designs we offer. 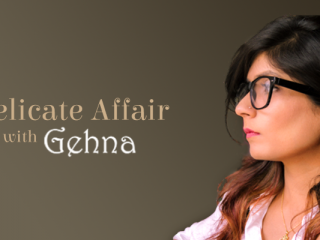 Visit Gehna for exquisite jewellery, handcrafted to perfection, as every girl is unique in her own way. Note: Pictures of celebrity used in this blog are only for visual purposes. The celebrities are neither associated nor endorse the brand or any of the above products. Above all, the rule of thumb is: If you Like it, Wear it!